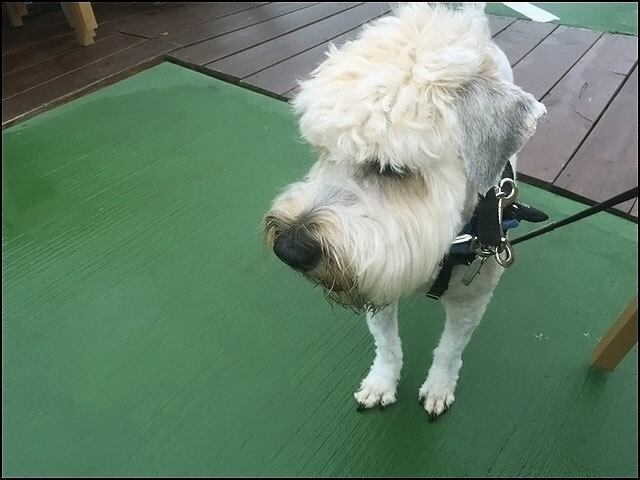 Despite the 90-degree weather, my friends and I managed to enjoy al fresco dining at a few of the popular eateries in this bea-u-ti-ful coastal city. And while the window displays in the local shops teased us with their capes and wool sweaters, we took advantage of some last-minute deals on summer clothing. All-in-all, it was a memorable weekend. Here’s a recap of my weekend getaway to Portland Maine with a few of my closest friends, as we toasted the end of summer 2017. 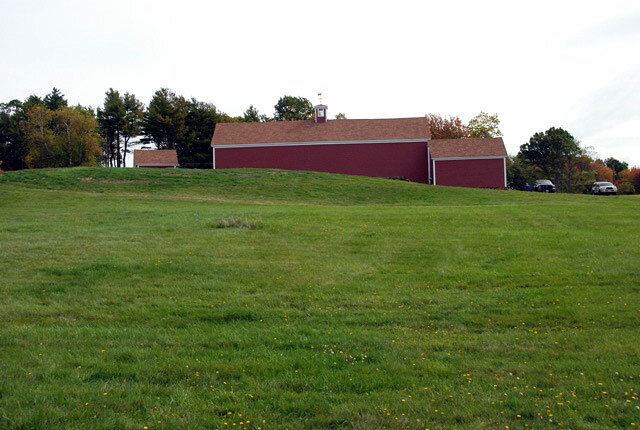 On Saturday, we arrived in Portland Maine around 10:30 am – just in time for lunch (!) – and we found parking to be a bit of sticker shock. Sorry, but it was. All public parking lots charge $5.00 an hour in downtown Portland and it’s credit card only. Be prepared. We took a walk over to Fore Street to look around and to find a place to eat lunch. 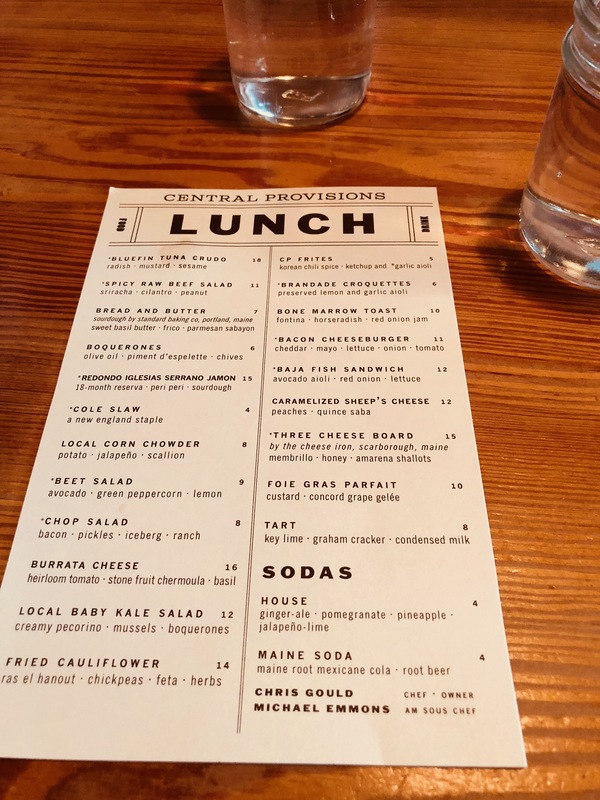 Tucked away in a little alley (that’s what we call them in Boston) off of Fore, we found Central Provisions and it did not disappoint. 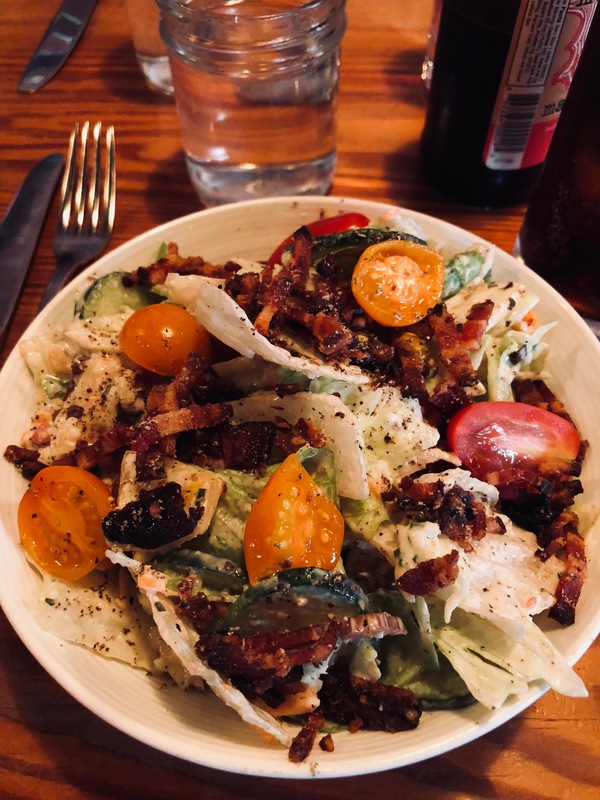 Not knowing how the evening would go food-wise, I decided to order the chopped salad with a side of the korean-spiced frites. Oh, those frites were to-die-for. By the end of our meal, we all wanted a second order of them. Since we were setting sail on a sunset wine cruise later that evening, we went with a lighter drink for lunch. 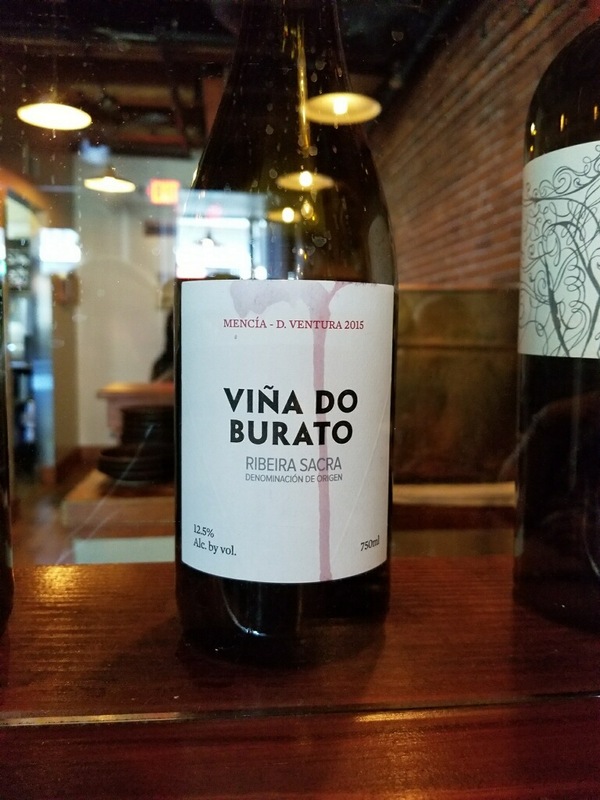 A yummy Spanish red that I am still trying to find at my local wine shop. Hello, University Wine! 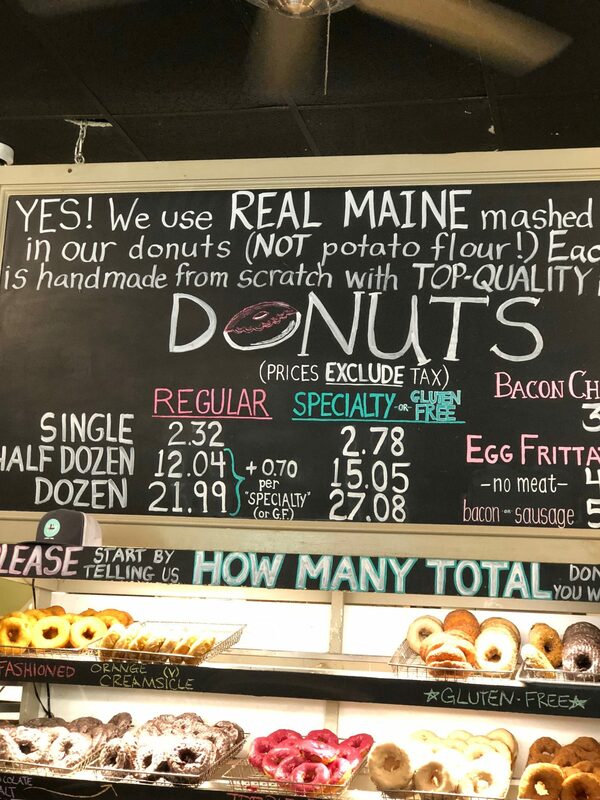 No lunch is complete without dessert, and since we are in the second donut capital of the U.S. – the first being Boston – we had to check out the The Holy Donut on Exchange Street to see what all the buzz was about. And yes, there was a line out the door even on this unusually hot day. Lots of options here, but we decided to split the dark chocolate, sea salt donut and we were pleasantly surprised. To walk that off, we had plenty of shops to get to before checking into our hotel. My usual suspects this summer have been Fat Face, The Black Dog, and Sea Bags of Maine but a few unique stores in Portland need mentioning: Something’s Fishy and Maxwell’s Pottery Outlet in Old Port. First off, if you are the kind of person that dreams of owning a pair of lobster pj’s or moose onesies, family-owned Something’s Fishy on Exchange Street is the place to go. And on this particular day, it was crowded with tourists. Note to self: You need the pink, “Don’t Moose with Me” onesie this winter, you just don’t know it yet. 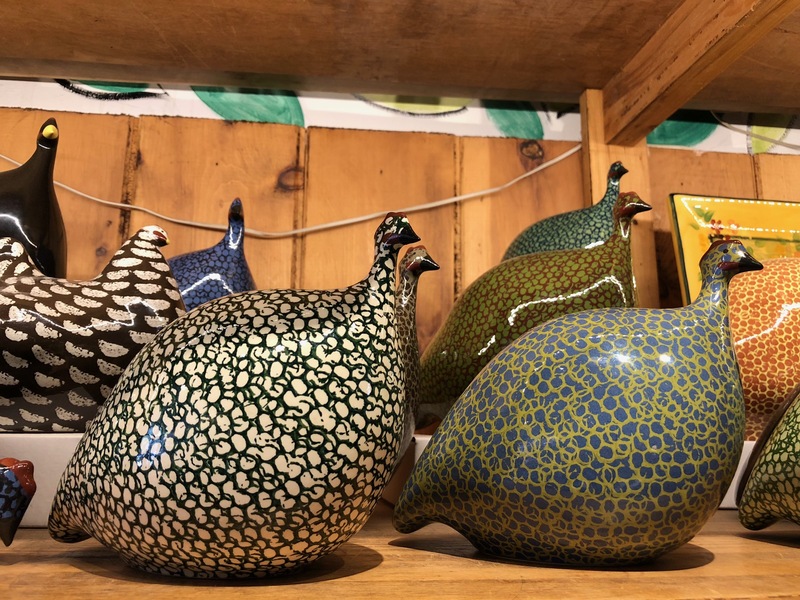 The Guinea hens at Maxwell’s Pottery Outlet were calling my name. 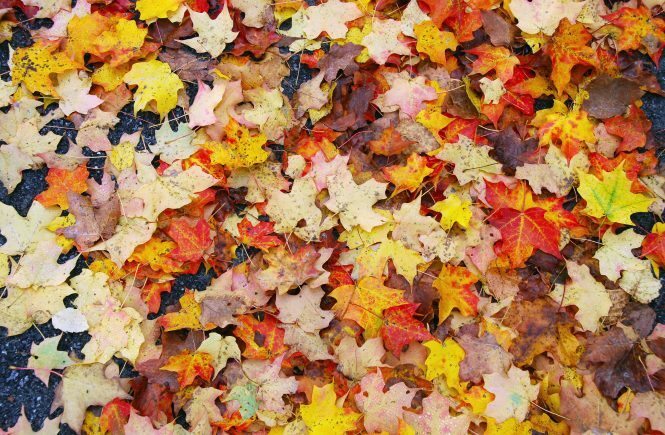 Seriously, how cute are these little guys and gals? Maxwell’s gets frequent shipments in from France – where they originated – and they are happy to order special colors for you. Just give them a call. 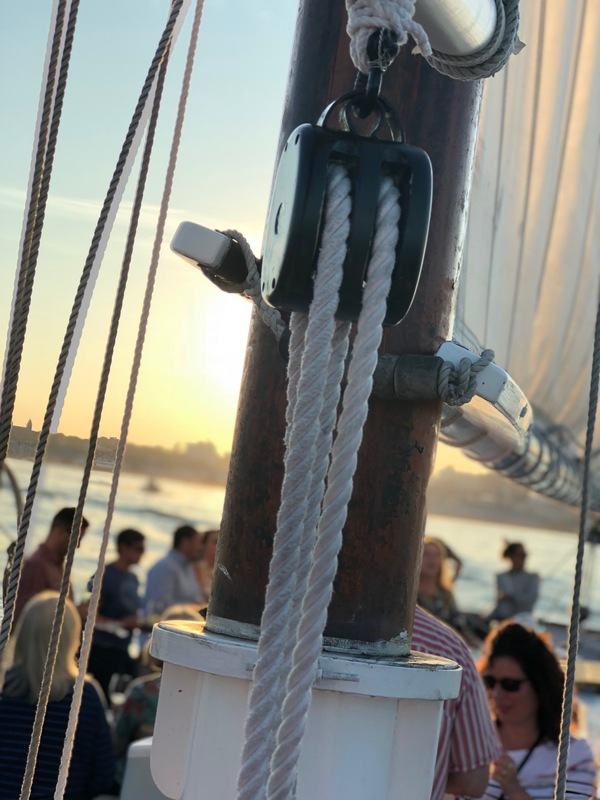 After we dropped our bags off at the hotel, it was time to freshen up and relax a bit before our evening sunset sail with Portland-based sommelier, Erica Archer. 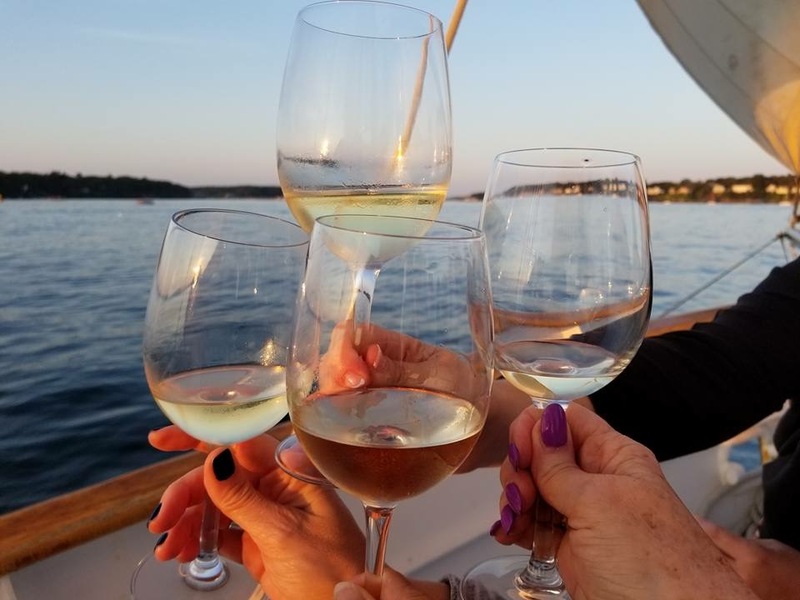 I had been drooling about this event all week, and was looking forward to a great evening on the water with friends, great wine and a bit of education, let’s be honest. The schooner we set sail on – The Frances – was a beauty and you can find more about the boat and it’s captain here. The Wine Wise events sell out pretty quickly, so we were lucky to book in advance and enjoy an evening of tasting 5 different wines from the Loire Valley. Cheese, fruit and crackers were provided and you really don’t need anything heavier than that. 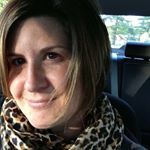 Did I mention the instagrammable pics? 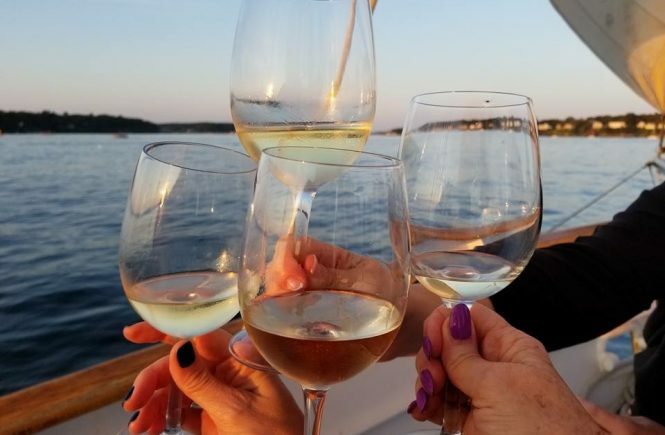 In addition to being out on the water with friends sipping wine, Erica creates the perfect escape by giving you a lesson on each wine, what to pair it with, how to taste and smell it, and based on its color, deciding whether or not its an older or younger wine. 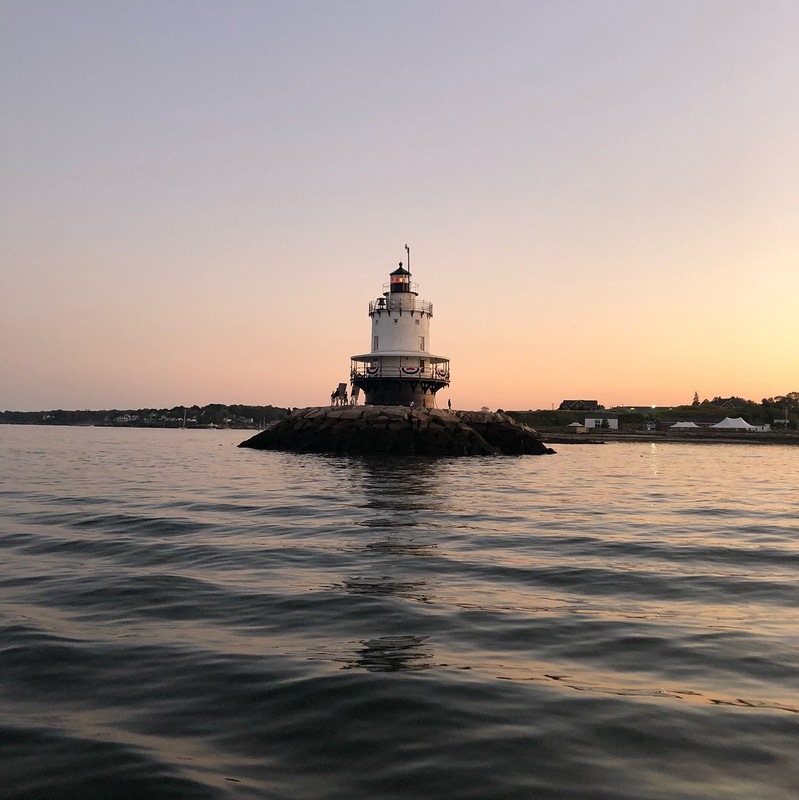 As the sun goes down, you head back to port and realize what a fabulous two-hours you have spent on the water, among good company. I can’t wait to see what Erica has in store for us next season. In the meantime, I might have to check out one of her winter walking wine tours. By Sunday morning, we were still in a fog from our wine sail. And we hadn’t had any lobster yet. Wait! We. Can’t. Leave. Maine. Without. Eating. Lobster. And we did just that. 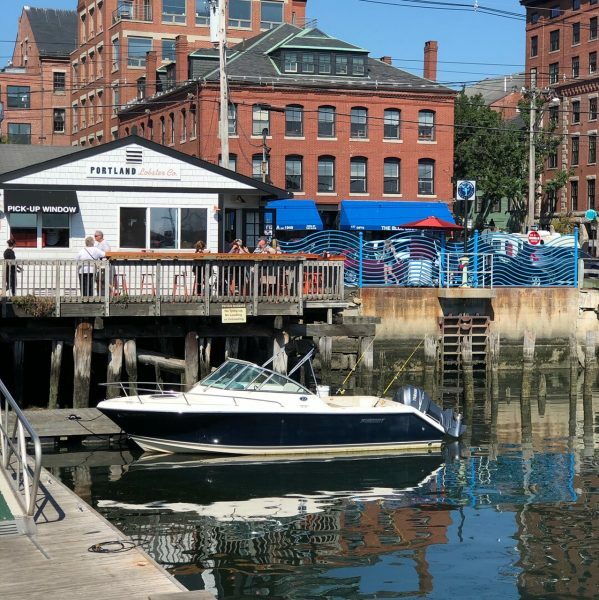 Portland Lobster Company, the award-winning place to eat in this city was buzzing all afternoon, but we were able to score a table on their dock before the crowds got long. Thank you, lobster gods! Pro tip: They don’t accept reservations, so stalking this place several times during the day is the key to success. 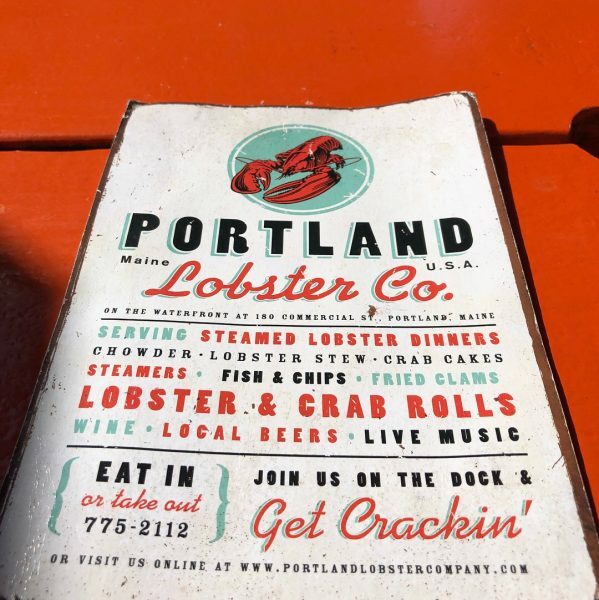 The lobster roll was delicious – did I really think it wouldn’t be? – and it was a bit surprising since instead of the usual mayonnaise spread, it was substituted for a light garlic butter rub. Yum! Plenty of beer and wine at the bar kept us merry for a couple of hours before we headed back home. Despite the July temps on this September day, seafood was the perfect choice. We packed a ton into this trip, so how do I sum it all up? Two words: wine and lobster. These are the only ingredients you’ll need to make your next Portland Maine getaway complete. Oh, and don’t forget to buy those lobster pajamas. Oddly, you will be wishing you had once you get home.